Exercise and lifestyle risk factor management are critical for the secondary prevention of cardiovascular disease but are poorly adhered to. Mobile health interventions could enhance engagement; however, a one-size intervention approach cannot meet the needs of all people. We hypothesize a unifying digital platform that enables choice from a suite of evidence-based programs will enhance access, delivery, and engagement. Address for correspondence: Ralph Maddison, Institute for Physical Activity and Nutrition, Deakin University, 221 Burwood Hwy, Burwood, Victoria 3125, Australia (E-mail: ralph.maddison@deakin.edu.au). Accepted for publication: November 30, 2018. Approximately 80% of coronary heart disease is caused by physical inactivity and other modifiable risk factors. Interventions targeting lifestyle risk factor modification are among the most effective but are poorly adhered to. Growing research evidence supports the effectiveness of mobile health (mHealth) interventions for improving exercise, physical activity, cardiorespiratory fitness, and other lifestyle risk factors for the secondary prevention of heart disease. Despite their effectiveness, no single mHealth intervention meets the needs of all people with heart disease. Current interventions are disparate, and a new paradigm is needed to consolidate access to evidence-based solutions and assist people to choose from a range of delivery options that best suit their individual needs. Extending existing research, this paper describes a unifying digital platform that helps participants choose from a suite of evidence-based interventions designed to enhance access, delivery, and engagement with programs for the secondary prevention of heart disease. Cardiovascular disease, including coronary heart disease, is the leading cause of death and disability globally (1). For people with existing coronary heart disease, cardiac rehabilitation involving exercise alongside other lifestyle changes, behavioral support, adhering to prescribed medication regimens, and control of risk factors can reduce recurrent cardiac events and aid recovery (2,3). Despite proven effectiveness, cardiac rehabilitation participation rates as low as 20% (4) suggest that this center-based delivery model — which has barely changed in recent decades — may not meet the needs of many eligible individuals. Reasons underlying nonparticipation are complex, but accessibility barriers such as limited availability of center-based programs, domestic or occupational responsibilities, transport restrictions or lack of parking, and geographic isolation all reduce participation (5). Technology-based approaches offer potential to improve accessibility, delivery, and provision of secondary prevention interventions for people with coronary heart disease. For example, telehealth — which uses information and communication technologies to facilitate interaction between patients and health-care providers — has been investigated as an option for improving the delivery and accessibility of home-based cardiac rehabilitation. A 2016 systematic review of 11 telehealth-based exercise cardiac rehabilitation trials (N = 1189) found that physical activity level was higher after telehealth delivered exercise cardiac rehabilitation compared with usual care (6). Compared with center-based exercise rehabilitation, telehealth was more effective for enhancing physical activity level, exercise adherence, diastolic blood pressure, and low-density lipoprotein cholesterol. Telehealth and center-based exercise rehabilitation were comparably effective for improving maximal aerobic exercise capacity and other modifiable cardiovascular risk factors. Although these findings support telehealth, research has been predominantly limited to land-based telephone, Internet, and video-conferencing technologies that confine participants to fixed locations. As such, there is a need to explore technologies that support greater program flexibility. Increasingly, powerful mobile technologies such as smartphones and wireless physiological sensors could extend the capability of telehealth-based rehabilitation (6). Given their ubiquity, mobile devices combined with the Internet offer unprecedented opportunities to improve population health and well-being by significantly increasing intervention reach, utilization, and effectiveness. Mobile health (mHealth) is a component of electronic health and has been defined as medical and public health practice supported by mobile devices, such as mobile phones, patient-monitoring devices, or other wireless devices (7). mHealth involves the use and capitalization on a mobile phone’s core utility of voice and short message service (SMS) as well as more complex functionalities and applications (apps) including third, fourth, and fifth generation mobile telecommunications (3G, 4G, and 5G systems), global positioning system, and Bluetooth technology (7). 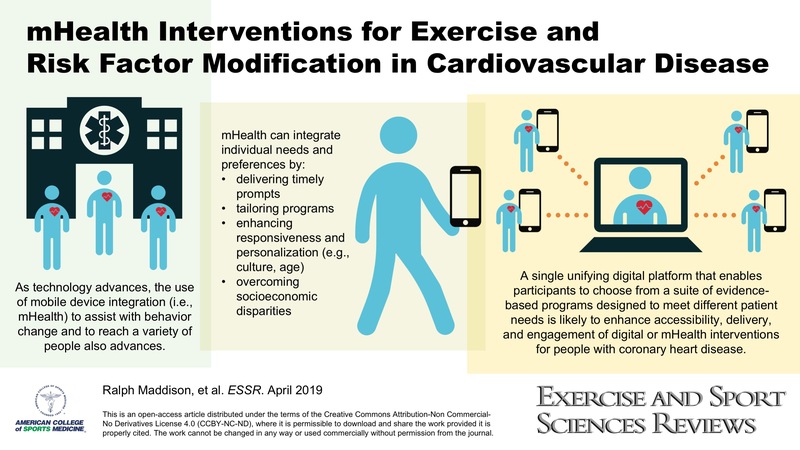 This paper will briefly outline the pros and cons of mHealth programs for delivering exercise-centric rehabilitation and provide an overview of key findings from randomized controlled trials of mHealth interventions in people with cardiovascular disease. We argue the typical one-size approach to mHealth delivery does not meet the needs of all people who need it. We hypothesize that a single unifying digital platform that enables participants to choose from a suite of evidence-based programs designed to meet different patient needs is likely to enhance accessibility, delivery, and engagement of digital interventions for people with coronary heart disease. In this paper, we briefly describe a recently developed initial prototype of such a digital platform (named Salvio), including future components. mHealth offers numerous potential benefits over traditional secondary prevention programs (7) such as 1) delivering intervention content anywhere, at any time — facilitating regular communication with participants and engagement with health promotion services; 2) delivering prompts, reminders, and behavioral support notifications in a time-sensitive manner — tailoring programs to fit individual lifestyles; 3) supporting proactive service-initiated programs that remove requirements for participant action or attendance before initiation of information and support; 4) enhancing responsiveness to, and personalization for, cultural, age, health, and other individual needs and preferences; 5) increasing reach by overcoming barriers of face-to-face contact; and 6) decreasing socioeconomic disparities in accessibility by embracing high mobile phone penetration across these groups (8). Despite the potential benefits of mHealth, questions remain regarding its sustained effectiveness, and largely atheoretical approach (9). This is particularly true of existing smartphone apps on iTunes and Google Play store. A systematic review and content analysis of smartphone apps showed many of the apps reviewed lack theory-based behavior change techniques, and those that did include behavior change techniques; the average number of techniques used was lower than previously reported for other types of physical activity promotion (10). There also have been concerns regarding the lack of regulation of medical apps (11). Another criticism of mHealth relates to a potential digital divide, which refers to the divergence between those who have unequal access to digital technology and the Internet (12). However, this concept may have less relevance with ever-increasing access to the Internet and mobile phones; in 2017, over 3.8 billion people accessed the Internet (13). Over the past decade, there has been emerging interest in the use of mobile technologies for supporting self-management of many chronic diseases, including diabetes, (14,15) cardiovascular disease (16), and chronic obstructive pulmonary disease (17). We have been at the forefront of developing and evaluating mHealth solutions for people with, or at risk of, cardiovascular disease, including text messaging (i.e., SMS) and smartphone-based interventions. These trials include the HEART, (18) Text4Heart, (19) TEXT ME, (20) and REMOTE-CR (21) randomized controlled trials. Here, we outline the key features of the respective programs and summarize key results. HEART was a 24-wk program of text-messages and a supporting Web site that aimed to improve leisure-time physical activity in people with coronary heart disease (18). Messages were unidirectional (from research team to participant only) and included exercise prescription according to clinical guidelines (approximately 25% of messages), as well as theory-based (self-efficacy) (22) behavioral support to initiate and maintain physical activity and exercise behaviors. Participants received 3–5 text messages per week (total of 118 messages over 24 wk). Participants were encouraged to log onto the Web site once per week to view new information and video messages (three new messages added per week, 30–60 s in length). In total, 171 participants were randomized and all were able to access usual care, which could involve usual cardiac rehabilitation services. From baseline to 24 wk, both groups showed small increases in peak oxygen uptake (intervention Δ = 0.9 mL·kg−1·min−1; control Δ = 0.9 mL·kg−1·min−1); however, there was no statistically significant difference observed between groups at 24 wk (adjusted difference = −0.2 mL·kg−1·min−1, 95% confidence interval (CI): −1.1, 0.7; P = 0.65). Significant treatment effects were observed in favor of the intervention (N = 85) for selected secondary outcomes including self-reported leisure time physical activity (difference = 110.2 min·wk−1, 95% CI: −0.8, 221.3; P = 0.05) and walking (difference = 151.4 min·wk−1, 95% CI: 27.6, 275.2; P = 0.02). If rolled out as a national program, HEART was likely to be cost-effective for increasing leisure time activity and walking. Text4Heart (N = 123) also was a 24-wk text messaging program and focused on improving adherence to recommended lifestyle behaviors including physical activity, diet, smoking cessation, and nonharmful alcohol use (19). As with the HEART trial, all participants were able to access usual cardiac rehabilitation services. In addition to usual care, participants in the intervention group (N = 61) received a fully automated core program of text messages on “Heart Health”; they also could choose additional behavioral modules they wanted to focus on modifying (e.g., physical activity, healthy diet, smoking cessation, and alcohol use). To encourage lifestyle change, the intervention was based on social cognitive theory (22,23). The Common Sense Model (24) also was used because it specifically outlines coping strategies for modifying illness perceptions and the negative emotions that arise with a health threat such as a myocardial infarction. Participants received seven messages per week (one per day) and had access to a supporting Web site. They also received a pedometer to self-monitor their physical activity. Messages were tailored to participants’ name and preferred time of day for receiving messages. In the latter 12 wk, message frequency decreased to five per week. Bidirectional messaging was used because participants were prompted to text in their weekly pedometer step counts and to ask questions or for feedback on other behaviors. Reponses to step counts were automated and based on the number of steps achieved, whereas individual questions were responded to personally by the research team within 48 h. The supporting Web site was accessed using a secure log-in system and included additional information, biweekly tips from the research team via a participant blog, graphs displaying their pedometer step counts, and short video messages from role models and medical professionals. Text4Heart demonstrated a statistically significant treatment effect in favor of the intervention on adherence to ≥3 healthy lifestyle behaviors at 3 months (adjusted odds ratio (ORadj) = 2.55, 95% CI: 1.12, 5.84; P = 0.03), but not at 6 months (ORadj = 1.93, 95% CI: 0.83, 4.53, P = 0.13). The intervention group reported a significantly greater medication adherence score than the control group (mean difference = 0.58; 95% CI: 0.19, 0.97; P = 0.004). The most comprehensive evidence for text messaging on an objective outcome in this population was provided by Chow et al. (20) who demonstrated that a 6-month automated text-messaging program (TEXT ME; N = 710) was associated with reduced low-density lipoprotein cholesterol (primary outcome; mean difference = −5 mg·dL−1, 95% CI: −9, 0; P = 0.04). The TEXT ME intervention also was associated with increased self-reported physical activity (Δ = 345 MET min·wk−1, 95% CI: 195, 495; P < 0.001) and improvements in other risk factors (systolic blood pressure, smoking). TEXT ME involved delivery of regular semipersonalized text messages (participant’s preferred name) providing motivation, advice, and information on how to improve diet, increase physical activity, and encourage smoking cessation (if relevant). Participants received four messages per week for 24 wk. For this trial, a library of messages was developed with input from investigators, clinicians, academics, and patients, informed by the Australian Heart Foundation Healthy Living Guidelines. In terms of smartphone interventions, we have developed and evaluated a sophisticated program of remotely delivered exercise support (REMOTE-CR) (21,25). Using wearable sensor, mobile, and web technologies, the REMOTE-CR platform allowed participants to access real-time monitoring and coaching from clinical exercise specialists while exercising in their home or local environment (Fig. 1). The program also delivered evidence- and theory-based behavioral support — providing people with a personal coach in their pocket. Behavioral intervention content was grounded in self-efficacy (22) and self-determination theories (26) and included a suite of behavior change techniques (27), focused on increasing confidence and motivation to exercise, overcoming barriers to being physically active, scheduling exercise into daily life, goal setting, and enhancing social support and networks to be active. Features on the smartphone app also allowed participants to review their exercise performance and assess progress toward personalized goals. Findings from a noninferiority trial (N = 161) in which we compared REMOTE-CR (N = 82) with standard center-based cardiac rehabilitation showed no statistically significant difference in V˙O2max (primary outcome) between the conditions (adjusted mean difference (95% CI) = 0.51 [−0.97, −1.98] mL·kg−1·min−1, P = 0.48). The 95% CI lower bound fell above the prespecified −1.25 mL·kg−1·min−1 inferiority margin, indicating REMOTE-CR was noninferior to center-based CR; nonadjusted changes from baseline to 12 wk were 1.7 and 3.3 mL·kg−1·min−1 (or 8% vs 12%) for the control and intervention groups, respectively (21). Importantly REMOTE-CR was substantially cheaper to deliver than the standard center-based exercise program. Per capita program delivery (NZD1130 vs NZD3466) and medication costs (NZD331 vs NZD605, P = 0.02) were lower for REMOTE-CR. Hospital service utilization costs were not statistically significantly different (NZD3459 vs NZD5464, P = 0.20); 1 NZD = 0.67 USD at September 11, 2018. In sum, we have developed and evaluated both SMS and smartphone interventions for enhancing exercise, physical activity, diet, and risk factors for coronary heart disease. Two interventions (HEART and TEXT ME) are likely to be cost-effective (18,28), whereas REMOTE-CR showed significant cost savings compared with standard center-based exercise delivery (21). Collectively, this body of evidence supports the utility of mHealth for augmenting existing services for people with coronary heart disease and may go some way to address some of the limitations associated with the current standard cardiac rehabilitation delivery model (29). Despite the effectiveness of these (and other) digital interventions, they remain disparate solutions with no central platform bringing them together. No single intervention meets the needs of all people with heart disease, thus a new paradigm is needed in which people are provided a choice of delivery options to best suit their needs. Such a solution would enable enhanced communication and exchange with healthcare providers, who could then assist patients to customize their secondary preventions by making informed choices from a suite of available self-management programs. A critical component of self-management approaches is to help individuals develop skills and behaviors, which allow them to effectively manage their chronic condition, prevent further progression of the disease or exacerbation of symptoms, and enhance health-related quality of life (30). Encouraging individuals to actively engage in this process has the potential to enhance the maintenance of a healthier lifestyle (31). Strategies that enhance patient empowerment and encourage patient autonomy and choice within their strategies have been shown to be important ingredients in effective interventions (32). To address this need, we have developed a new proof-of-concept digital platform — accessed via a patient portal called Salvio — that draws together a suite of evidence-based and effective mHealth interventions. The interventions are accessible to consumers, enabling them to identify and choose their preferred option and delivery approach (text messaging programs and smartphone app; Fig. 2). Akin to an App store, participants can access these programs; however, unlike an App store, Salvio hosts a suite of theory-based programs that have undergone rigorous evaluation as described previously. We hypothesize that a single integrated patient portal, which provides people with central access to country-centric information on their condition and offers flexibility to choose programs that best suit their individual needs (e.g., text, smartphone, or other) and preferred target behaviors (e.g., exercise, diet) will promote empowerment, improve adherence, and ultimately ensure they realize the considerable benefits associated with cardiac rehabilitation (33–35). Unlike existing Web or online education programs, Salvio does not provide education but rather offers participants the opportunity to choose and activate behavior change interventions. Participants access the secure Salvio portal via referral from a health practitioner or self-referral. The former may facilitate conversation around the current needs of the individual and optimal programs to engage with. Once at the portal, a series of simple profiling questions are used to guide participants to existing digital interventions (described previously) that are likely to satisfy their individual needs and preferences (Fig. 2), and Salvio allows participants to activate their chosen intervention(s). For example, if they want help to manage all aspects of their disease, participants can activate a comprehensive text-messaging intervention (e.g., HEART exercise program). Alternatively, if they want more intensive exercise training support, they can activate REMOTE-CR. This type of platform has enormous potential to facilitate large-scale implementation of tailored secondary prevention services for cardiovascular disease and could be adapted for other chronic diseases in the future. A central platform could allow those with limited access to traditional services (e.g., those living in regional or rural locations) to receive lifestyle change and risk factor modification support that is typically only offered via face-to-face cardiac rehabilitation programs. There is increasing evidence that mHealth interventions can support the modification of lifestyle risk factors such as exercise among people with coronary heart disease; however, existing interventions are disparate. A digital platform with a patient portal offers a unique opportunity to help people to select evidence- and theory-based programs that meet their individual needs and preferences to optimize self-management of their disease. Research reported in this review received funding from the Health Research Council of New Zealand (Grant 10/446; Sir Charles Hercus Fellowship), New Zealand Heart Foundation (Grant 1429), Auckland Medical Research Foundation (Grant 1113020), National Heart Foundation of Australia (G10S5110), and BUPA Foundation (Australia). 1. Eapen ZJ, Peterson ED. Can mobile health applications facilitate meaningful behavior change? Time for answers. JAMA. 2015; 12(12):1236–7. 2. Mozaffarian D, Benjamin EJ, Go AS, et al. Heart disease and stroke statistics — 2015 update: a report from the American Heart Association. Circulation. 2015; 131(4):e29–322. 3. Law MR, Watt HC, Wald NJ. The underlying risk of death after myocardial infarction in the absence of treatment. Arch. Intern. Med. 2002; 162(21):2405–10. 4. Worringham C, Rojek A, Stewart I. Development and feasibility of a smartphone, ECG and GPS based system for remotely monitoring exercise in cardiac rehabilitation. PLoS One. 2011; 6(2):e14669. 5. Jones M, Jolly K, Raferty J, Lip GY, Greenfield S, BRUM Steering Committee. “DNA” may not mean “did not participate”: a qualitative study of reasons for non-adherence at home- and centre-based cardiac rehabilitation. Fam. Pract. 2007; 24. 6. Rawstorn JC, Gant N, Direito A, et al. Telehealth exercise-based cardiac rehabilitation: a systematic review & meta-analysis. Heart. 2016; 102(15):1183–92. 7. World Health Organisation Global Observatory for eHealth, mHealth: New Horizons for Health Through Mobile Technologies. Based on the Findings of the Second Global Survey on Health, in Global Observatory for eHealth Series. Volume 3. Geneva: World Health Organisation; 2011. 8. Pew Research Centre. The smartphone difference. Washington (DC): Pew Research Centre; 2015. 9. Orr JA, King RJ. Mobile phone SMS messages can enhance healthy behaviour: a meta-analysis of randomised controlled trials. Health Psychol. Rev. 2015; 9(5):397–416. 10. Middelweerd A, Mollee JS, van der Wal CN, et al. Apps to promote physical activity among adults: a review and content analysis. Int. J. Behav. Nutr. Phys. Act. 2014; 11:97. 11. Visser B. There's a medical app for that. Br. Med. J. 2012; 344:e2162. 12. Norris P. Digital Divide: Civic Engagement, Information Poverty, and the Internet Worldwide. Cambridge: Cambridge University Press; 2001. 13. Internet World Statsitscs. World Internet Users Statistics and 2017 World Population Stats [Internet]. 2017 [cited 2018 November 12]; Available from: http://www.internetworldstats.com/stats.htm. 14. Dobson R, Whittaker R, Jiang Y, et al. Effectiveness of text message based, diabetes self-management support programme (SMS4BG): two arm, parallel randomised controlled trial. Br. Med. J. 2018; 361:k1959. 15. Shariful Islam SM, Niessen LW, Ferrari U, et al. Effects of mobile phone SMS to improve glycemic control among patients with type 2 diabetes in Bangladesh: a prospective, parallel-group, randomized controlled trial. Diabetes Care. 2015; 38:e112–3. 16. Varnfield M, Karunanithi M, Lee CK, et al. Smartphone-based home care model improved use of cardiac rehabilitation in postmyocardial infarction patients: results from a randomised controlled trial. Heart. 2014; 100(22):1770–9. 17. Farmer A, Williams V, Velardo C, et al. Self-management support using a digital health system compared with usual care for chronic obstructive pulmonary disease: randomized controlled trial. J. Med. Internet Res. 2017; 19(5):e144. 18. Maddison R, Pfaeffli L, Whittaker R, et al. A mobile phone intervention increases physical activity in people with cardiovascular disease: results from the HEART randomised controlled trial. Eur. J. Prev. Cardiol. 2015; 22(6):701–9. 19. Pfaeffli Dale L, Whittaker R, Jiang Y, et al. Text message and internet support for coronary heart disease self-management: results from the Text4Heart randomized controlled trial. J. Med. Internet Res. 2015; 17(10):e237. 20. Chow C, Redfern J, Hillis GS, et al. Effect of lifestyle-focused text messaging on risk factor modification in patients with coronary heart disease: a randomized clinical trial. J. Am. Med. Assoc. 2015; 314(12):1255–63. 21. Maddison R, Rawstorn JC, Stewart RAH, et al. Effects and costs of real-time cardiac telerehabilitation: randomised controlled noninferiority trial. Heart. 2019; 105:122–9. 22. Bandura A. Self-Efficacy: The Exercise of Control. New York (NY): W.H. Freeman and Company; 1997. 23. Bandura A. Human agency in social cognitive theory. Am. Psychol. 1989; 44:1175–84. 24. Leventhal H, Brissette I, Leventhal E. The common-sense model of self-regulation of health and illness. In: Cameron L, Leventhal H, editors. The Self-Regulation of Health and Illness Behaviour. London: Routledge; 2003. p. 42–65. 25. Maddison R, Rawstorn JC, Rolleston A, et al. The remote exercise monitoring trial for exercise-based cardiac rehabilitation (REMOTE-CR): a randomised controlled trial protocol. BMC Public Health. 2014; 14:1236. 26. Deci EL, Ryan R. Handbook of Self-Determination Research. Rochester (NY): The University of Rochester Press; 2002. 27. Michie S, Ashford S, Sniehotta FF, et al. A refined taxonomy of behaviour change techniques to help people change their physical activity and healthy eating behaviours: the CALO-RE taxonomy. Psychol. Health. 2011; 26(11):1479–98. 28. Burn E, Nghiem S, Jan S, et al. Cost-effectiveness of a text message programme for the prevention of recurrent cardiovascular events. Heart. 2017; 103:923–30. 29. Lavie C, Kachur S, Milani R. Making cardiac rehabilitation more available and affordable. Heart. 2019; 105:94–95. 30. Grady P, Gough L. Self-management: a comprehensive approach to management of chronic conditions. Am. J. Public Health. 2015; 104(8):25–31. 31. Lorig K, Holman H. Self-management education: history, definition, outcomes, and mechanisms. Ann. Behav. Med. 2003; 21(1):1–7. 32. Kuijpers W, Groen WG, Aaronson NK, et al. A systematic review of web-based interventions for patient empowerment and physical activity in chronic diseases: relevance for cancer survivors. J. Med. Internet Res. 2013; 15(2):e30. 33. Balady GJ, Williams MA, Ades PA, et al. Core components of cardiac rehabilitation/secondary prevention programs: 2007 update. Circulation. 2007; 115(20):2675–82. 34. Heran BS, Chen JM, Ebrahim S, et al. Exercise-based cardiac rehabilitation for coronary heart disease. Cochrane Database Syst. Rev. 2011; 7:CD001800. 35. Bethell H, Lewin R, Dalal H. Cardiac rehabilitation in the United Kingdom. Heart. 2009; 95. Exercise and Sport Sciences Reviews47(2):86-90, April 2019.